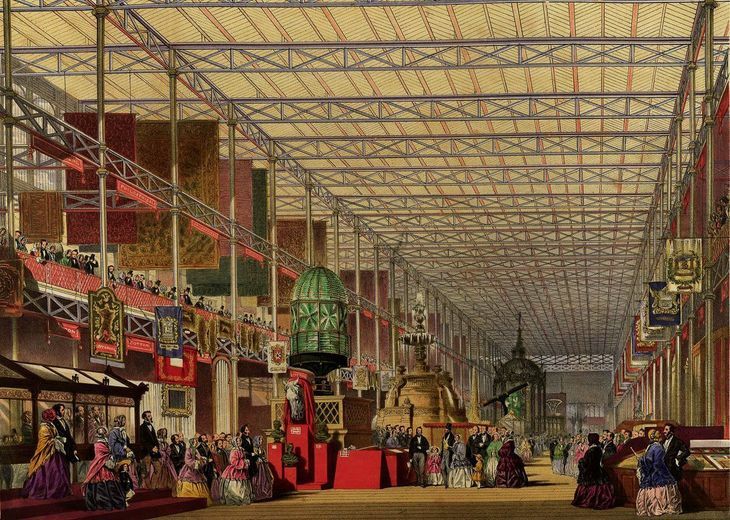 Ever Wondered What The 1851 Great Exhibition Was Like? 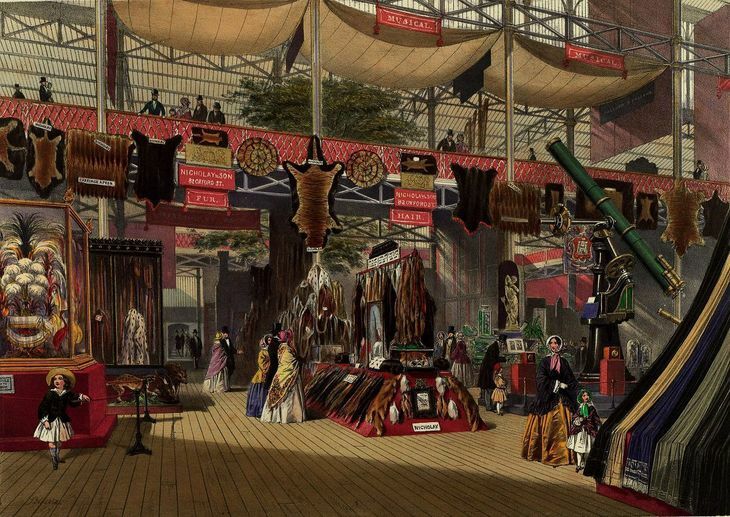 Zoe Craig Ever Wondered What The 1851 Great Exhibition Was Like? The Crystal Palace, Hyde Park. 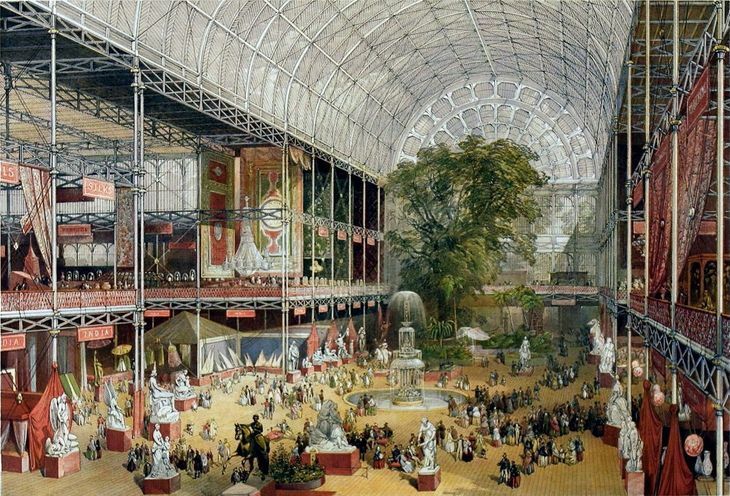 We've all heard of, and read about, London's Great Exhibition of 1851, organised by Prince Albert and Henry Cole, as the first 'World's Fair' to show off all the new technologies of the Victorian age. But how many people have seen these amazing pictures from inside the show? 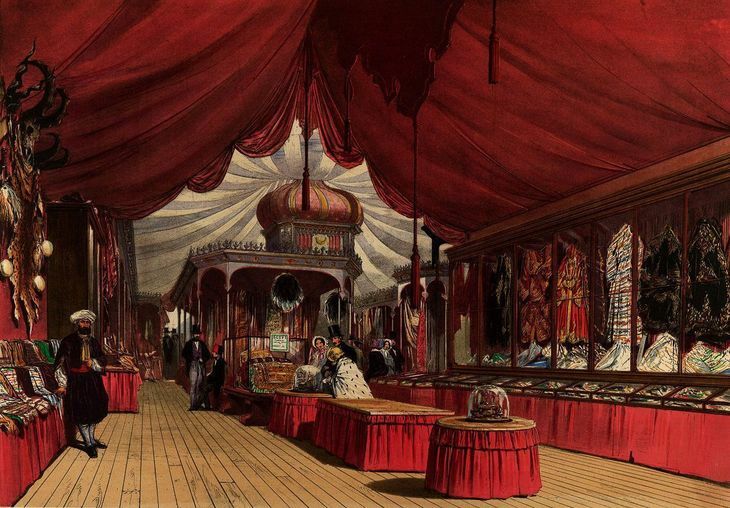 These gorgeous illustrations, by Louis Haghe, Joseph Nash, David Roberts are from a book called Dickinsons' Comprehensive Pictures of the Great Exhibition of 1851. The transept, seen from the Grand Entrance, complete with mature trees. 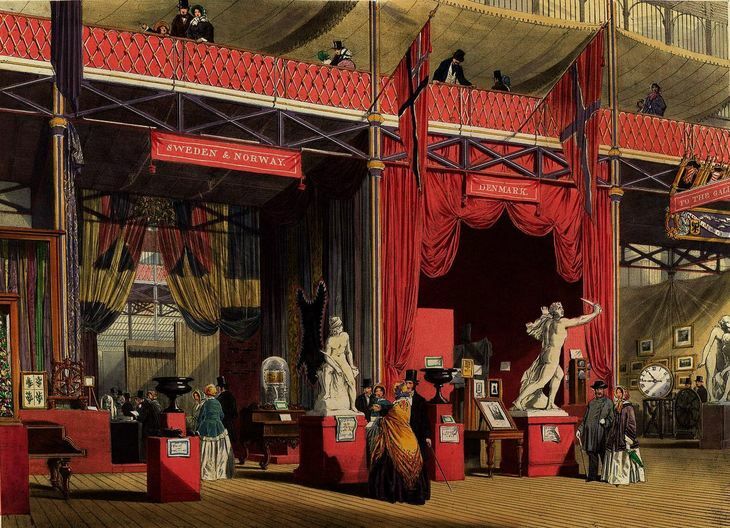 You might feel disappointed that there are no photographic mementoes from the Great Exhibition. But the stunning detail captured by these three incredibly talented artists gives a pretty succinct idea of what it was like. 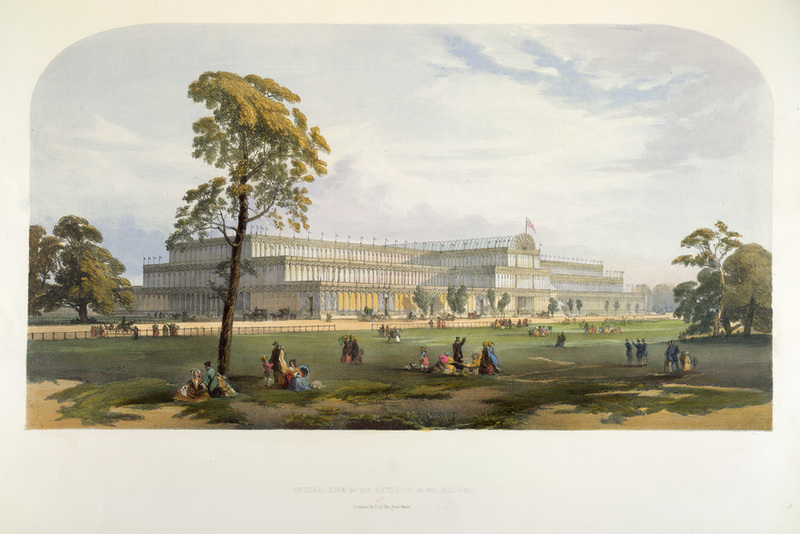 The exhibition was housed in a vast iron and glass building constructed specifically for the purpose in Hyde Park — the Crystal Palace. Stretching 1,851 feet long and 128 feet high, Paxon's incredible masterpiece was built around several elm trees to prevent them from being cut down. The Foreign Department, viewed towards the trancept. You can see Russia in the bottom left corner. 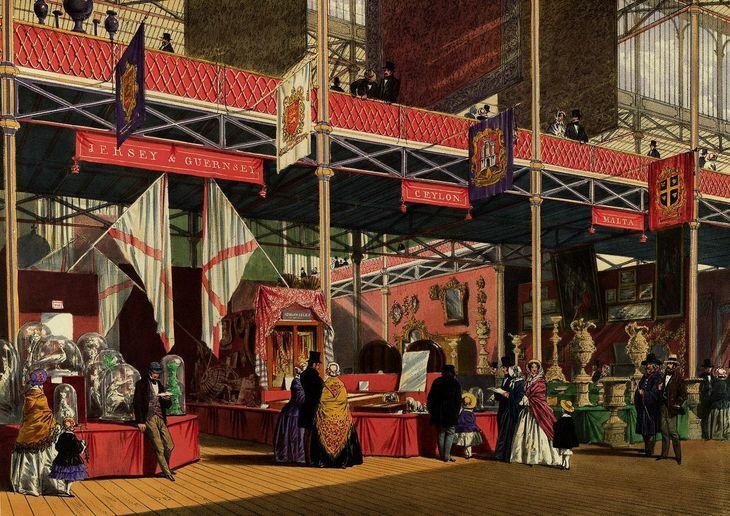 Queen Victoria performed the opening ceremony; other famous visitors to the exhibition included William Makepeace Thackeray, Charles Darwin, Charles Dickens, George Eliot, Lewis Carroll and Charlotte Brontë. More than 100,000 objects were displayed by over 14,000 exhibitors from around the world. The British Nave at the Great Exhibition. The exhibits were grouped into four principal themes: Machinery, Manufactures, Fine Arts and Raw Materials. 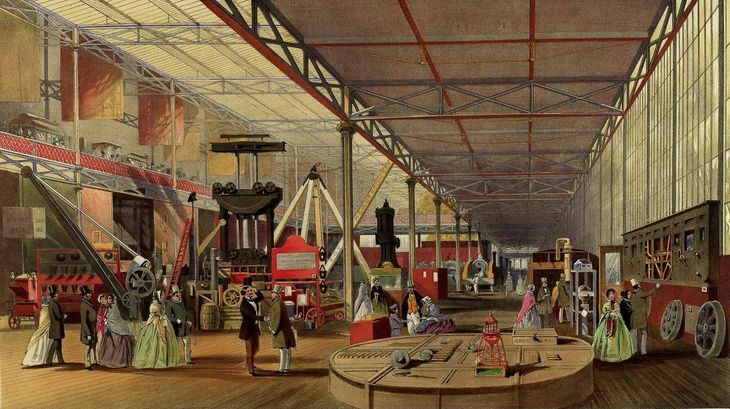 Machinery on display at the Great Exhibition. The Russian exhibits arrived late, having been delayed by ice in the Baltic. When they did arrive, they were breathtaking: huge vases and urns made of porcelain and malachite more than 10ft tall; furs; sledges and Cossack armour. Canada sent a fire engine with painted panels showing Canadian scenes, and a trophy of furs. 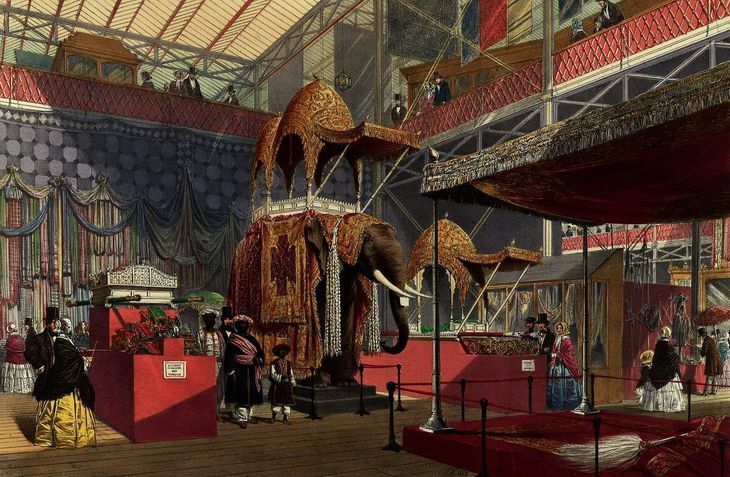 India contributed an elaborate throne of carved ivory, a coat embroidered with pearls, emeralds and rubies, and a magnificent howdah and trappings for a rajah’s elephant. The elephant wearing it in the illustration below came from a museum of stuffed animals here in England. Chile sent a single lump of gold weighing 50kg. Two very popular exhibits were the the Koh-i-Noor diamond, in the India exhibit; and the Daria-i-Noor, one of the world's rarest pale pink diamonds. C C Hornung of Copenhagen, Denmark, showed his single-cast iron frame for a pianoforte, the first made in Europe. Displays from Sweden, Norway and Denmark. 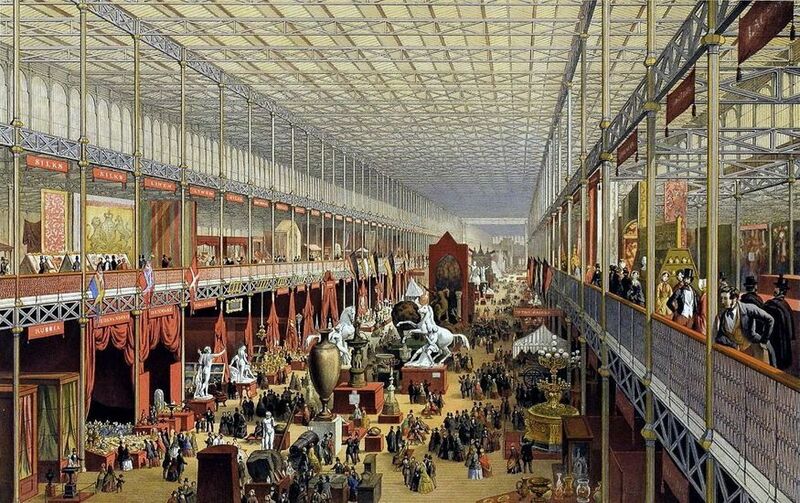 More than six million people — equivalent to a third of the entire population of Britain at the time — visited the exhibition during its relatively short opening period between 1 May and 11 Octover 1851. The average daily attendance was 42,831 with a peak attendance of 109,915 on 7 October. Jersey, Guernsey and Ceylon (now Sri Lanka) side by side at the show. Many of the visitors had travelled to London from far afield via the country's rapidly expanding railway network. After the six-month exhibition, the palace was taken down and rebuilt in south London, though in a slightly new design. The reconstituted building remained a major landmark in what is now Crystal Palace Park from 1854 until 1936, when it burned down. 1. The event made a profit of £186,000 (about £18,370,000 in today's money). This was used to found three little institutions we know today as the Science Museum, Natural History Museum, and the Victoria and Albert Museum. 2. George Jennings (inventor of the flushing loo) provided the first public toilets in the Retiring Rooms of the Crystal Palace, for which he charged one penny. 3. 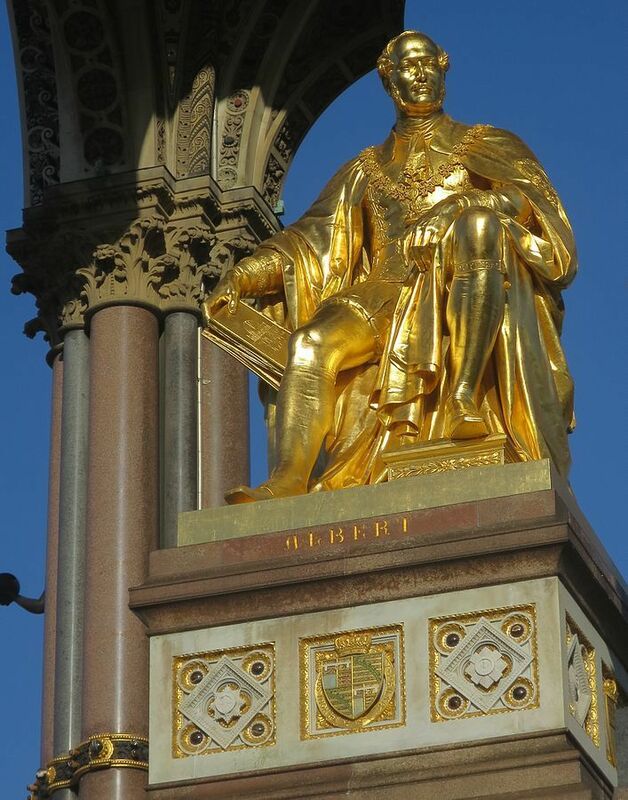 In his statue within the Albert Memorial in Hyde Park, Victoria's beloved prince has the catalogue from the Great Exhibition in his hand. Albert's holding the Great Exhibition catalogue in his hand. Want to see more images from the Great Exhibition? Check out the full book here in the Smithsonian archives.